Pre-Assembled: The three 115 CFM high-speed fans are pre-installed into a 3U heavy gauge steel panel to provide an out-of-the-box solution. The vented steel panel allows air to move through it with ease while also providing a protective barrier over the face of the fan. Easy to Install: Rack mountable panel easily mounts in any 19" EIA compliant rack or cabinet. Simply mount using rack screws (and cage nuts if needed) and plug it in to start moving air within your rack configuration. 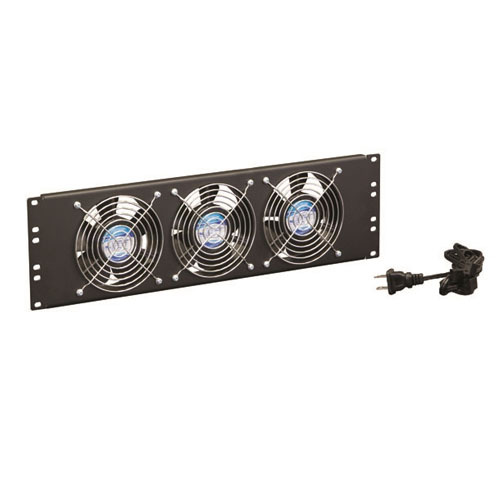 Specially Designed Power Cord: The Triple Fan Panel includes a 3-tail power cord. This power cable supplies power to all three fans with only using one outlet of your rack mountable UPS or power strip. Optional Grounding: Each cooling fan features two threaded ground holes for grounding each fan in the installation where specific electrical or network configurations require it.